I was undecided about writing up a tutorial for these, but I received a ton of emails asking me if I would after posting my original leaf potholders two weeks ago. I had made three for myself, but really wasn't up to making any more. However, when someone asked me to make them a pair? I finally had a reason to make some and take some pictures for you! I have finally been able to create a .pdf on Craftsy for this tutorial. 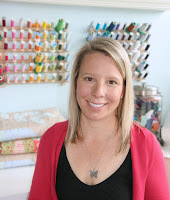 I had some quilter friends that said "Thanksgiving Host gift idea!". And I totally agree! Too bad I am the hostess this year? I also think they would be great as a housewarming party gift if the family was moving in at this time of the year, and there is always the newly married couple! 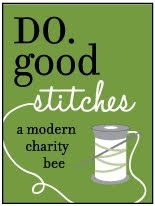 Please, please, PLEASE do the right thing and tag or link back to me, my blog, or Craftsy site if you post pictures/blog/sell the potholders. Thank you so much for the tutorial and pattern....i will try some tomorrow! Cool !!! Thanks for sharing !!! I think it's wonderful that you are willing to share this for nothing. Thank you! Muy claro el tutorial,me encanto. I have been looking for a pattern like this and "yeah" here it is. Great tutorial. Your instructions and pictures are clear and easy to follow. Thanks for sharing. I'm sure this is probably obvious to all but me. I guess all thread, fabric, and batting must be cotton. GREAT question Karen! I normally am not a stickler about materials, but on this project, I would recommend cotton materials. Some nylons and mixed media fabrics could melt from contact with the heat. What a great idea! What I'm most impressed with are your extremely detailed and close up photos of every step. along the way and look forward to seeing more tutorials from you. Thanks so much. Awesome! It really is a great scrap-buster!!!! These are great! Your tutorial is excellent. Thanks so much for taking the time! These are absolutely wonderful! Thanks for sharing this tutorial! What a great tutorial! Thanks for sharing !!! Thank you for this tutorial. I love it. Christmas presents for several members of my family. Can you please tell me the *finished* size? love this. thank you so much. I hope I can make this. I love these i'm going to give this a try. they are so cute. i can understand about the boys. My son was like having 10 little indians. Can use the template, etc. and substitute the strips of fabric with NFL football fabric to make a football potholder by straightening out the one side that isn't straight and putting the loop at the top end point instead of leaving it off sides .. Just a suggestion to make similar to the ones I am making up using local NFL football fabric to make same... I hang mine off of one of those banana tree holders to display same on my counter, next to my stove for display and to grab quickly to use. I can't see where you get the pattern?? It must be there in all the wonderful instructions but I just cant see it. Hi!! Click on the image or go to "my patterns" in the title bar and you will be taken to My Craftsy pattern store. 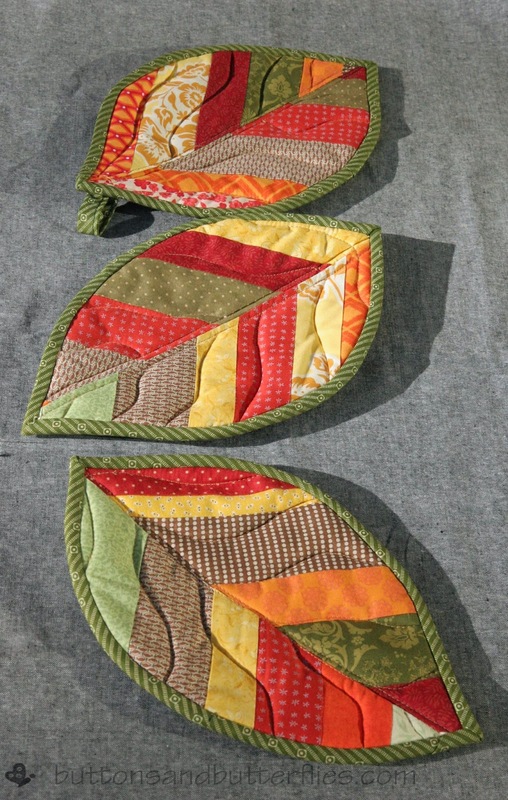 Many thanks for the pdf pattern for your leaf potholder. Will make lovely gifts. Your tutorial is beautifully set up. Thanks for your tutorial. I used it for inspiration for a mini-quilt I made. I linked back to here. I just love leaves. In the new year, I am going to try and take the size up to a placemat. This is so clever and I love the mini quilt that one of your readers designed. Thank you for your inspiration! Thank you so much for sharing this lovely tutorial! I would love to make this. Looks so great. Thanks for the idea. Love this work, I am definitely trying them!